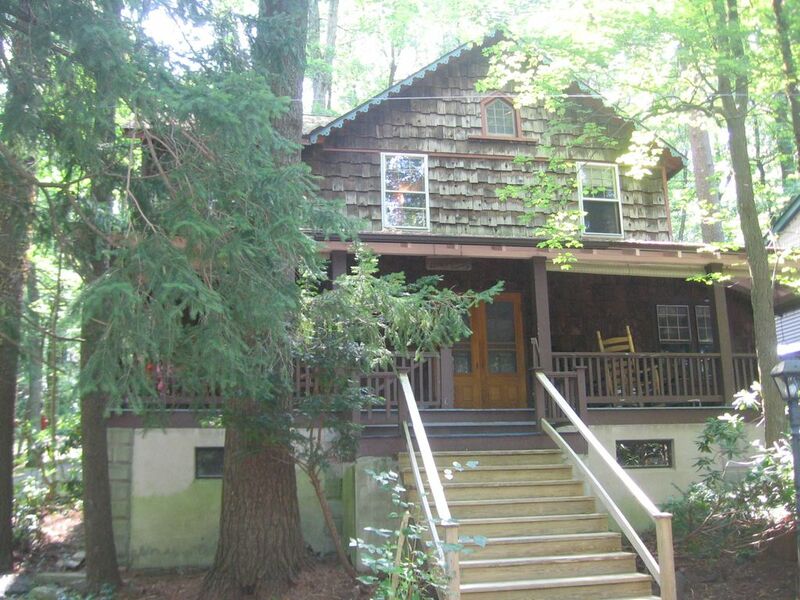 This 4 bedroom, 2 bath cottage has room for the entire family and more. Picture yourself in this spacious home with large living room with fireplace, a sizable kitchen open to a dining area, and a screened rear porch with dining area. There is also a full bath with shower and laundry on the main level. The second floor has 4 large bedrooms. Two bedrooms have a queen bed, 1 other bedroom has a double bed, and the fourth bedroom has 2 single beds. There is a full bath with claw foot tub with shower on the 2nd level. The large front porch has plenty of seating to enjoy the view of the lake or tennis courts. This cottage is large enough to bring the whole family (and Fido too) and still have room to spare. The location is within walking distance to the lake, Jigger Shop, playground and more. The rear screened porch is a wonderful place to sit and enjoy your breakfast, lunch or dinner. My family and I spend a great family reunion. This is our second time staying here and it is very roomy and comfortable get away in the woods. You are steps away to walking paths through wooded areas which my greyhound loves. Was very warm. Beds are comfortable. Everything you need is there. Rustic yet with modern day amenities. The cabin reminded me of the quaint early 20th century lakeside colonies I've read about. The house has retained the character of the Mt Gretna Chataqua houses and cottages and at the same time has been updated to have the modern conveniences of a well stocked kitchen with microwave, two bathrooms, comfortable furniture. The back porch is lovely. As a bonus our greyhound was welcome - and Nicky gave it a "greyt" rating! At first the heat did not come on (it was a bit chilly), but that was quickly resolved. This is our third time in Mt Gretna and the first time on the Chataqua side. We would love to rent this house again! Property was not cleaned, cobwebs all over bedroom ceilings, shower door would not stay closed, house had a mold odor. Also nothing to do after labor day unless you drive to surrounding towns. So everywhere we went was from 30 minutes to an hour .filters in air conditioners were so thick with dust we cleaned them. Would not recommend.